Soon after IRG acquired the Goodyear Tire and Rubber Company campus, Phase I construction began on the new, 642,000-square-foot Goodyear World Headquarters and was completed in 2013. The new headquarters includes a parking structure, as well the revitalization of certain other buildings on Goodyear Tire and Rubber Company’s campus. The Phase I construction, financed in part by EB-5 funding, created significant job opportunities in the region. Redevelopment nears completion for Phase II, which includes the original 1.4 million-square-foot Goodyear Headquarters and Goodyear Hall, reimagined as a live, work, play environment known as “The East End.” The East End’s primary use is office space, including large institutional and public government-type users and other large-office users. The combination of a hotel, office, medical, retail, restaurants and loft apartments creates a dynamic synergy on the property. 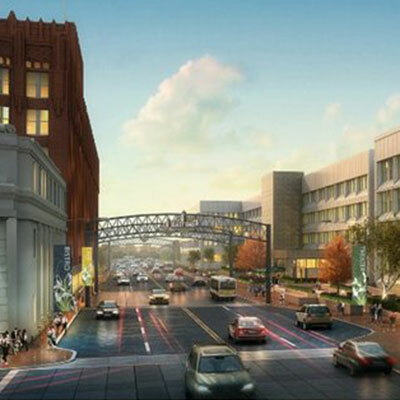 The area running along East Market Street has been transformed into a pedestrian-friendly entertainment district, reflecting extensive streetscape improvements and the renovation of Goodyear Theater, a 1,400-seat entertainment destination, adjoined by Goodyear Hall Gymnasium, a center for national, regional and local events. The site recently hosted an event honoring LeBron James’ philanthropic work, and Hillary Clinton made it a campaign stop during the 2016 election. The East End project has won many awards, including: Novogradac Journal of Tax Credits Historic Rehabilitation 2016 Historic Rehabilitation Award – Historic Development that Best Exemplifies Major Community Impact; Northeast Ohio Apartment Association, 2016 Property of the Year Award; NAIOP Northern Ohio, 2016 Mixed-Use Renovation of The Year Award; Cleveland Restoration Society/AIA Cleveland, 2016 Distinguished Adaptive Use Award; and State Historic Preservation Office Award, 2016 Preservation Merit. The project has also gained national media attention from The New York Times, The Wall Street Journal and Forbes Magazine.